The meditation group practices Vipassana (Insight) Meditation. They meet in the sanctuary every 1st and 3rd Saturday morning at 10:00 am. We welcome newcomers at anytime. 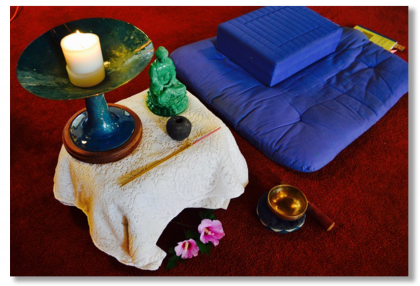 Our practice favors sitting meditation. We have some cushions if you don’t bring your own, and we use chairs. We sit for two sessions of 24 minutes divided by a walking meditation of 3 to 5 minutes. There are readings from and about Buddhism and Buddhist practice, a short reading at the beginning, a bit longer reading at the end. The group has been meeting for some 15 to 20 years. Sample readings have been from S. N. Goenka, Pema Chodron, Tich Nhat Hanh, the Dalai Lama, Chogyam Trungpa, Sharon Salzburg, Pankaj Mishra, Joseph Goldstein, John Wildwood, Karen Armstrong, and Steven Batchelor.